The secret of cooking tasty meat lies not only in the recipe, but also in technology, its pre-processing. Sometimes it really is not so soft as we would like. The situation may save him a beating before cooking. Even the most high quality meat benefits from this. The beating makes it not only soft but also juicy. Usually working use a special hammer. However, with this task perfectly cope and other handy items. Meat tenderizer in the absence of special you can hammer with a knife. This would require a heavy and thick knife. Cut the meat into pieces and return them is not sharp, and the back side of a knife in different directions. You can also use the handle of a knife, if it is wide enough. To make the meat soft and regular glass bottle, or rather her neck. When pitching them pieces of meat are even softer and lighter than when hitting with a hammer. To do this, simply tap on the piece of meat of the neck. However, you can fight him off and the bottom of the bottle. In this case, it is advisable to pre-fill it with water. Good function hammer handle a rolling pin and a wooden tolkushkoy for mashed potatoes. Just don't overdo it. Excessive beating can turn juicy meat in the dry. You can recapture the pieces of meat with the flat side of the pan. Only they must be pre-wrapped in plastic film or plastic package for hygiene purposes. The role of a meat mallet will do a great job stone. You need to find cobblestone povesila, put it in a plastic bag and only after that, start hitting the meat. A piece of meat can fight off the base or edge of your palm. However, beat - it loudly. Rather, you have just to soften the meat. Try not to beat the meat to the holes, you only have to slightly "stretch" it, that is, to make thinner. To recapture a piece of meat, the thickness of which is less than 2 inches, it makes no sense. In this case, you will not improve, but rather only adding to its flavour and juiciness, as a result, the piece of meat after frying to be "cracker". Before hitting the meat, dampen the cutting Board with cold water to dry wood does not absorb meat juice. Blood to splatter from meat flew in different directions, put it in a plastic bag and only then return. The process of pounding meat was virtually silent, put a cutting Board under the towel. Without meat it is difficult to imagine the menu of most people. Meat dishes delicious, nourishing and nutritious. In shops and on markets you can buy almost any kind of meat. Pork was and remains one of the most purchased. Nourishing bone broth, a wonderful, delicate flesh, offal... And all you can eat cook and serve. One dish that is suitable and in the feast and in the world are the pork chops. Take pork meat without bones. It is best to prepare chops fit the loin or tenderloin. The meat in one piece, rinse in cold water. Washed a piece of meat dry. Cut the meat into pieces with a width of about 1 cm to pork chops well-done, turned out soft and easy to chew, slice the meat must across the grain. Special hammer (it can be wood or metal) well repel the pieces of meat with two sides. This must be done carefully to avoid injury and to avoid spray in all directions. RUB chopped meat on both sides with salt, spices for pork or ground black pepper. Be careful, many condiments, salt is already included. Not perezalit chops! On a wide flat plate pour the flour. In a deep dish whisk the eggs until a homogeneous mass. In a pan heat sunflower oil. Roll chops in flour, then in beaten egg, then again in flour. Pork chops should be covered on all sides with flour and egg. Place the prepared steak on the pan and fry on low heat. Fry chops until Golden brown on one side, turn it over to the other side and cook until done. To serve you pork chops with any side dish. Bon appetit! Be careful putting the meat on the pan and turning over the chops. Fat spray in hand, can burn your hands. To avoid splattering of fat during frying of chops by using a special mesh from the spray. It has a kind of lid from the pan, but instead of glass or metal with its special mesh. Covering the pan with this mesh, you will protect against splashes of fat and chops will get a Golden crust outside on the pan. If the pan starts to burn the flour from the previous chops, the meat will acquire an unpleasant odor, you need to remove the pan from the heat, cool, wash and continue cooking the chops. The original solution for the festive table. Due to the special preparation of meat, he will be easily assimilated. and with the addition of cheese and tomatoes will get a taste of Italian cuisine. Can be served with vegetables as a separate dish. Cut pork slices with a width of 5-7 mm, put on a cutting Board and cover with clingfilm. Repel, remove the foil and sprinkle with salt to taste. Prepare the batter: divide in a separate bowl the egg, slightly beat, salt, add the flour. Mix everything. Give the batter a little to infuse in a warm place. Dip chops in batter and fry in a pan adding vegetable oil for 5-7 minutes. Cut tomato slices, salt it, RUB cheese on a grater. Turn over the chops, put on top of slices of tomato and a little grated cheese. Close the pan and fry for another 7-10 minutes. Gently spread the chops on a plate. Served with greens. It is better to use lean meat, for example pork chops or tenderloin. It should not be neglected in cling film at fighting off the meat, otherwise the muscle fibers will be broken and the dish will not look neat. Chops should not be too thick, otherwise they will not be cooked through as it should. Tomato can be cleaned from the skin, by rinsing it with boiling water. In order for the batter to be thicker, add more flour. 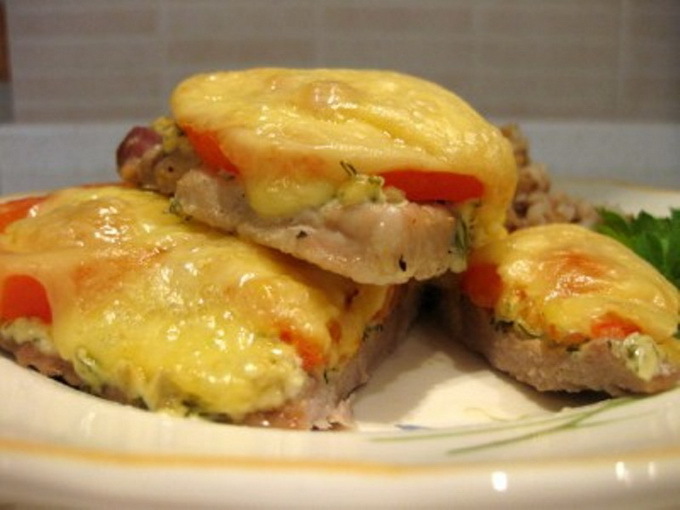 There are many ways to bake pork chops in the oven under the cheese. However, the most popular is considered the classic recipe of meat in French with pork, baked in the oven with cheese and potatoes. To prepare the classic meat in French will need: 500-600 g pork or beef, 1 kg of potatoes, 150-200 g of cheese, 2-3 onions, vegetable oil, salt and black pepper. It is advisable to use to lubricate the chops enough heavy cream. Choose for cooking chops best neck, loin, or the most succulent piece of ham. 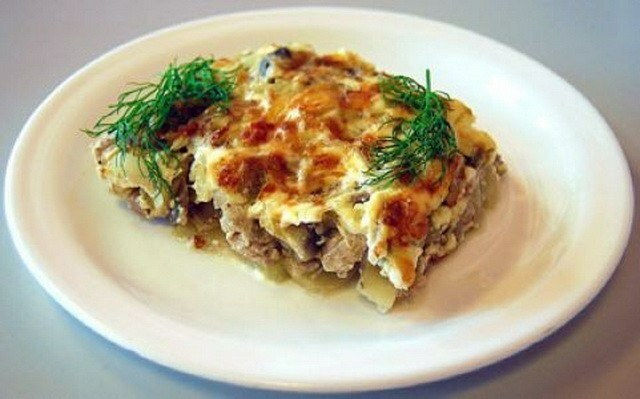 Too fatty pork to use is undesirable, since the combination of the cream will make the dish too heavy for the stomach. Lean pork will be too dry. 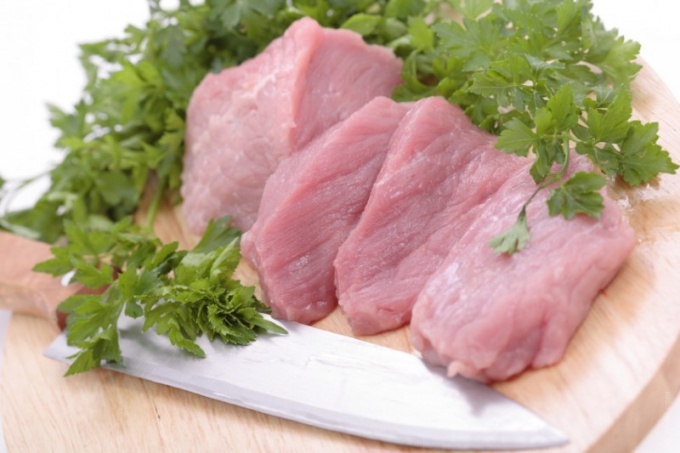 You should choose fresh pork is light pink in color with white fat streaks. If you decide to cook beef, the meat should not be too dark with yellow fat. It's a sign of old age of the animal, so the chops will get tough. Be sure to check the meat for firmness by pushing on it with your finger. In the fresh meat, the hole disappears quickly. The meat is washed and dried with paper towels. Then, cut portsionny pieces across the grain and a good beat with a special hammer or knife handle. To splatter of blood and small pieces did not scatter in all directions, it is recommended to wrap the meat in plastic wrap. Meat salt, pepper and proceed with peeling potatoes. Potato tubers cut into semicircles, of a thickness not exceeding 1 see onions finely chopped. Cheese rubbed on a coarse grater. Pre-heat the oven to 180-200oC. Grease a roasting pan with vegetable oil and spread it all prepared ingredients. The first layer stack potato slices, which you must sprinkle a small amount of salt. 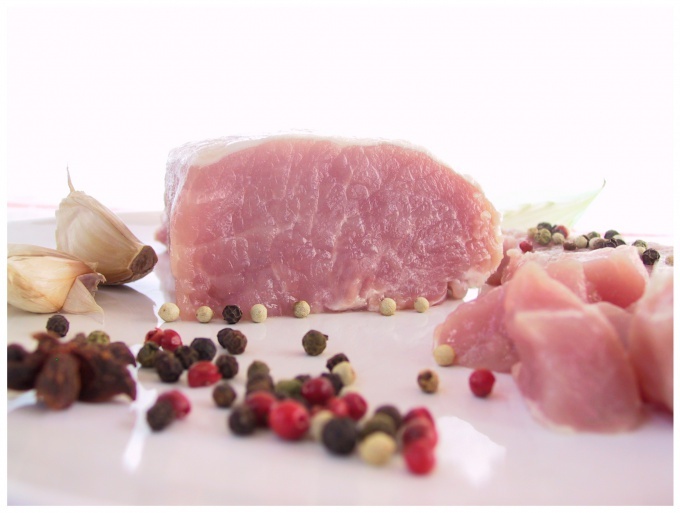 The second layer – chops, which, for richness lubricate greasy cream. The third layer consists of chopped onions. Next, repeat layers until then, until all components of the dishes are not over. Put the roasting pan in the oven. Potatoes and pork chops in the oven to keep within the hour. Then, the brazier removed the dish and sprinkle with grated cheese. After that, put the chops again in the oven for about 15 minutes. The dish is ready when the cheese is completely melted and sufficiently browned. Served French meat hot dish slice with a knife into portions like a pie. You can serve the chops with the potatoes directly in the roaster. Before being recommended to decorate the dish of chopped parsley or dill.